The sun provides us with warmth and is a source for vitamin D synthesis. Why do we need to protect from the Sun then? However, prolonged exposure to its rays can be harmful for the skin. Radiation from the sun has a wide spectrum of wavelengths, one of them is the ultraviolet radiation with wave length of 250-400 nm which affects the skin. This radiation can be further divided into long wave UV radiation (UVA), medium wave UV radiation (UVB) and short wave UV radiation (UVC). UVB (280-320 nm) is mainly responsible for skin damage in the form of suntan, sunburn and skin cancers. UVA penetrates deeper into the skin in comparison to UVB and is responsible for photo-sensitivity reactions, skin degeneration or aging and skin cancers. UVC is mostly filtered out by the ozone layer of the sky. If the ozone layer gets depleted in future, then UVC will add more damage to the skin. The UV rays can also diffuse through the clouds and cause sunburn even on a cloudy day. Higher altitude and proximity to the equator also results in greater exposure to UV rays. Damage caused to the skin cells results in the release of chemicals called cytokines or inflammatory mediators. This causes swelling, redness and increases melanin pigment formation (tanning). The sensitivity of people to sun rays varies and to some extent depends on pigmentation and hereditary factors. Wrinkling of skin occurs especially in people who work outdoors like sailors, farmers, builders and manual laborers. It results in damage to epidermis (superficial layer of skin) and dermis (deep layer of skin). Does your skin burn after sun exposure? Do you develop a tan after sun exposure? Regular use of sunscreens does not lead to Vit D deficiency. 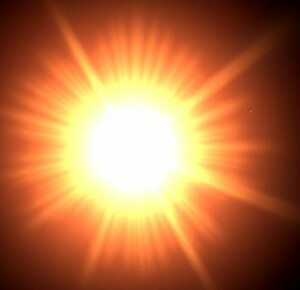 Avoid exposure to the sun especially in the middle of the day when the sun reaches its zenith. At this time the exposure to UV rays is maximal. Use shadow under a tree or by carrying an umbrella, large hat, sunglasses and protective clothing. Use sunscreens creams or lotions to protect your skin. Sunscreens are available commercially in a form of creams and lotions. When applied on the sun-exposed areas of our body, they filter or reflect the damaging UV radiation. They are effective against both UVA and UVB type of radiation. There is a lag in time between skin exposure to sunlight and the development of visible redness and it varies between individuals. The efficacy of the sunscreen is defined by ‘sun protection factor’ or SPF. It is a ratio of a minimum time required to produce redness of skin on sun exposure, with and without sunscreen application. To illustrate, if a person develops redness of skin on exposure to sun after 30 minutes with application of sunscreen and one minute without sunscreen, the SPF of the sunscreen is 30. The sunscreens are rated on a scale ranging from minimal (SPF 2 to 11), moderate (SPF 12 to 29) and high (SPF >30). Various ingredients of sunscreens include p-Aminobenzoic acid (PABA), Avobenzone, Cinoxate, Dioxybenzone, Ecamsuleb, Homosalate, Menthyl anthranilate, Octocrylene, Octyl methoxycinnamate, Octyl salicylate, Oxybenzone, Padimate O, Phenylbenzimidazole sulfonic acid, Sulisobenzone, Titanium dioxide, Trolamine salicylate and Zinc oxide. It is also important to mention that regular use of sunscreens does not lead to Vit D deficiency because the amount of light required for synthesis of Vit D is very small. Clinical studies done in mice have shown that the use of sunscreen can reduce the chances of genetic mutations in skin cells which may lead to cancer. Patients who have received organ transplants and are on immunosuppressive drugs (drugs which suppress body immunity) have very high chance of developing skin cancers. Sunscreens have been found beneficial in these patients. Sunscreen with high SPF (>30) are used in the treatment of phototoxicity and photoallergy. Phototoxicity is a drug associated skin damage on sun exposure. It may occur while taking amiodarone, tetracycline etc. Photoallergy is development of itchy skin rash associated with consumption of certain medications on sun exposure. Examples of such drugs include diclofenac and piroxicam. Sunscreens protect our skin from UV rays of sun. They are used both for cosmetic reasons and for protection from skin cancers in certain patients. Before buying a sunscreen always look for its SPF – the higher the SPF is, the better protective effect it has. ← Does smoking kill brain cells?